The American Federation of Teachers union was denied a temporary restraining order against Project Veritas on Tuesday after the union attempted to prevent the operation from releasing an undercover video targeting its Michigan chapter. District Court Judge Linda Carter, who lifted a restraining order filed by AFT against the conservative James O'Keefe group in December, denied AFT's new emergency restraining order request, writing in her decision that AFT "cannot show that its commercial interests are more fundamental" than the First Amendment rights of Project Veritas. 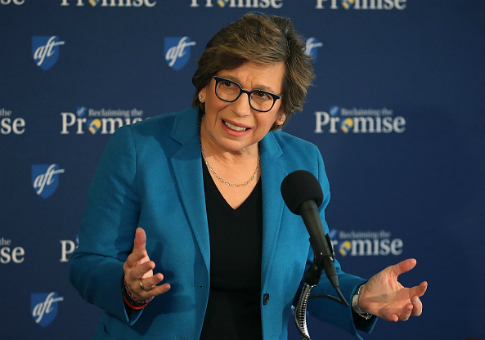 Union president Randi Weingarten stated she was disappointed and the union would continue to fight "unethical and unlawful smear campaigns against educators," according to the Washington Post. O’Keefe called the ruling "a victory for both journalism and for the First Amendment." Project Veritas released the video in question on Wednesday, showing what it called a "troublesome" saga of AFT Michigan and the Lake City Michigan school district's handling of a teacher accused of molesting a female student. The teacher, who was never charged with a crime and is not identified, ultimately received a $50,000 buyout from the school district after union negotiations. AFT Michigan field representative Johnny Mickles represented the teacher, who among his students, had the daughter of a woman he formerly dated. According to the report, the student told Superintendent Kimberly Blaszak the teacher inappropriately touched her several times when she was seven or eight years old in 2006, and the memories of the trauma came back when she became his student seven years later. "They say she totally changed, and it wasn't until she had this person as a teacher," Mickles said. "That’s why the superintendent was like ‘something happened.' Her grades went down." A Lake City school district document corroborated Mickles' account that Blaszak wanted to fire the teacher, and Mickles said the union negotiated a settlement for him. According to Mickles, the teacher was placed on paid leave until the settlement was drawn up. He received the remainder of his pay for the school year, along with a $50,000 payout from the district. "He knows what he did," Mickles said. "If he did something inappropriate, he knew it came back on him, and he wanted to run." The teacher is no longer in the education profession and has left Michigan. When Project Veritas spoke to him, he acknowledged an "accusation" having to do with a former girlfriend's daughter but said it wasn't true. "I said, ‘I'll retire,'" the former educator said. "‘And here's the conditions: I want this much pay until this date.' And I went to the attorney, for the school’s attorney, the teacher’s union attorney, and they said ‘we'll pay you to this date and we'll each go our own way.' I said ‘that's fine.'" Project Veritas journalists film their subjects with hidden cameras on their bodies and invent stories and assume fake identities to gain the trust of the subjects of their investigations. Their recent publications of sordid teachers unions practices in New Jersey resulted in the suspensions of two union presidents. This entry was posted in Politics and tagged Michigan, Teachers Unions. Bookmark the permalink.